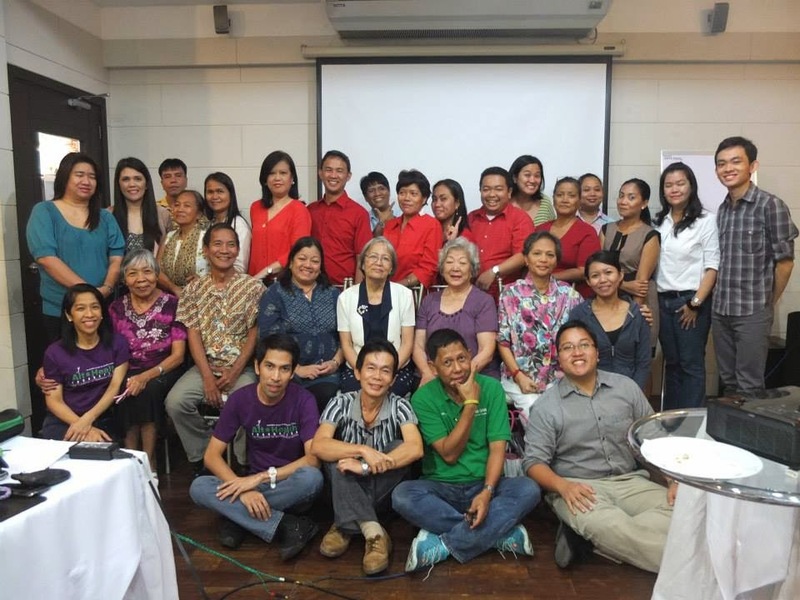 Last March 14, 2014, the Coalition for Health Advocacy and Transparency (CHAT) held its General Assembly this year at Dolce Latte Restaurant, Quezon City. 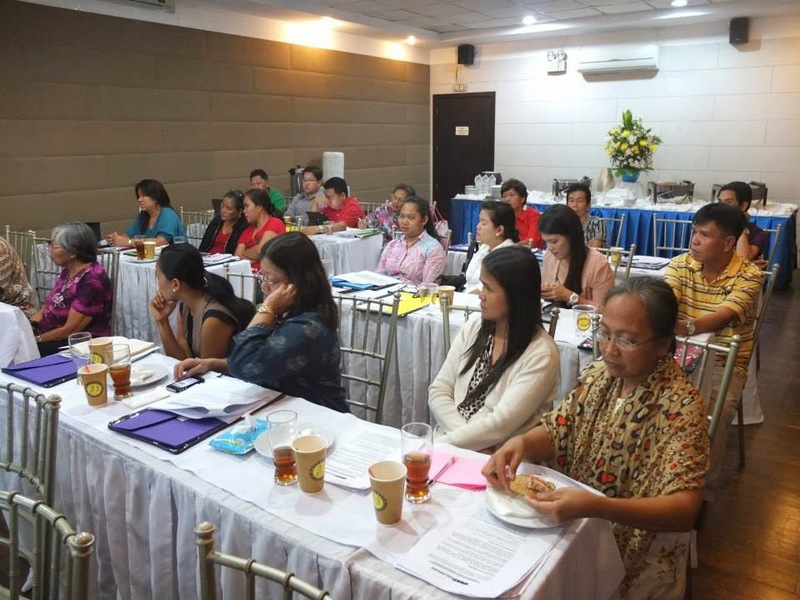 Minimal Government Thinkers is among the original charter members of CHAT when a Civil Society Mapping was held in January 2009 at Diamond Hotel in Manila, two days before the 3-days MeTA National Forum, same venue. CHAT is an alliance of health-focused civil society organizations (CSOs), people's organizations and public policy research organizations or think tanks (including IBON Foundation and MG Thinkers) that works with the Medicines Transparency Alliance (MeTA) Philippines as its civil society partner. It is a big coalition as some member organizations are themselves alliances or coalitions of their own. Like AGAP (Ayos na Gamot sa Abot-kayang Presyo) and 3CPNet (Cut the Cost, Cut the Pain Network). Ms. Cecile Sison of Philippine HealthWatch Initiatives, also of MeTA Philippines, discussed the covenant of CHAT. Then nice lunch. 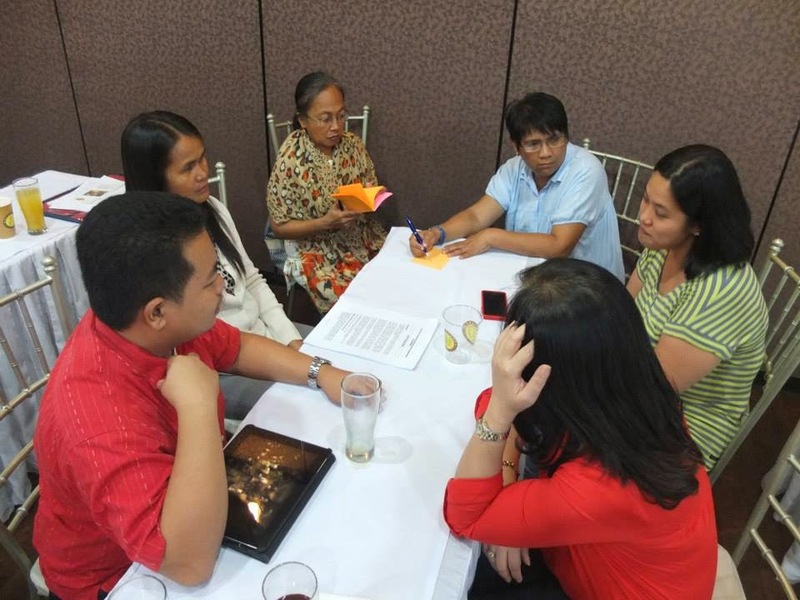 It was a working lunch, participants were paired and we discussed and suggested steps the alliance can take to re-engage and strengthen its role and advocacies, facilitated by Dr. Elmer Soriano. I did not speak during the open foru, and I did not stay long, after lunch I headed to the airport to catch my flight for Cebu City. 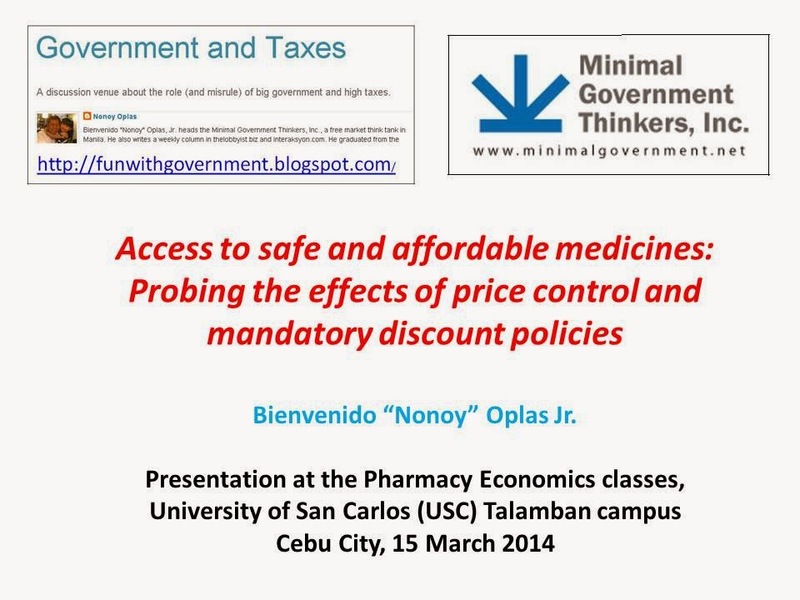 I was going to give a talk at the University of San Carlos (USC) the next day about government price control and mandatory discounts for medicines policies. 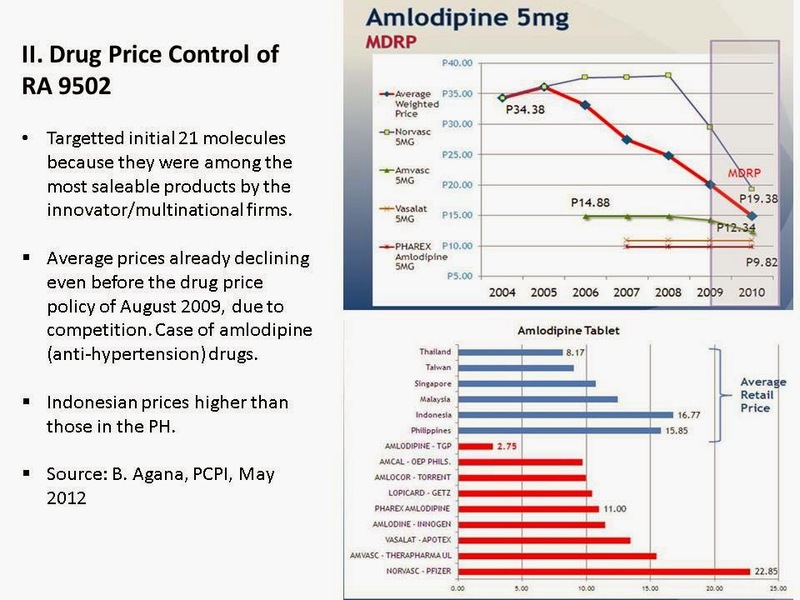 See Drug Price Control 39: Presentation at USC, Cebu, March 2014. Despite some disagreement on certain health policies with some key members of CHAT, I like the coalition. I am the "odd-man out" in most cases for advocating less government (but not zero government) intervention in many health policies, while majority of member-NGOs support more government involvement. Still, members learn to tolerate such divergence in ideas. Photo credit: Ian Nuevo of MeTA Philippines Secretariat. 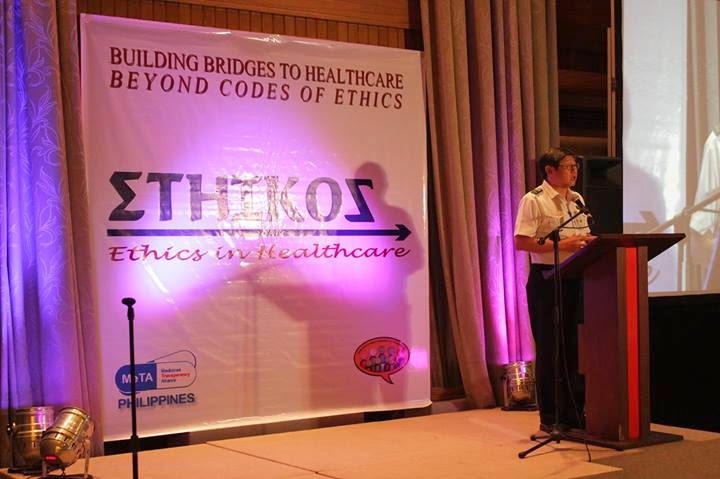 Last Thursday night, the ETHIKOS (Ethics in Healthcare) Movement was launched at C3 Events Place in Greenhills, San Juan, Metro Manila. Many participants from different groups and sectors. Some quotes from some speakers that night. All photos I got from the MeTA Philippines facebook page. Thanks Ian Nuevo. Gov. 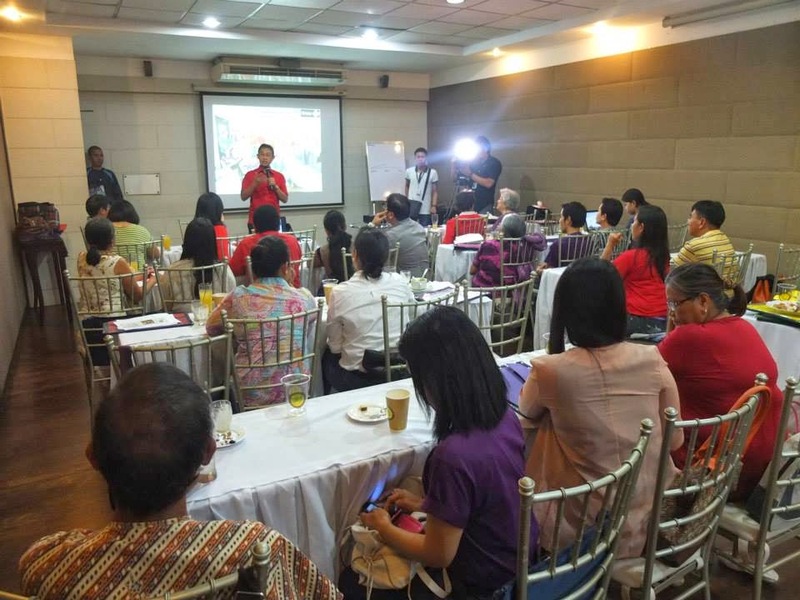 Obet thanked the participants, particularly the organizations that formed movement – the Medicines Transparency Alliance (MeTA) Philippines, the Coalition for Health Advocacy and Transparency (CHAT), and the British Embassy’s Foreign and Commonwealth Office (FCO). Then he introduced the Convenor Group of the ETHIKOS Movement: (1) Princess Nemenzo of WomanHealth, (2) Celia Carlos of the Drugstores Association of the Philippines (DSAP), (3) Girlie Lorenzo of Kythe Foundation, also of the Philippine alliance for Patient Organizations (PAPO); Tony Leachon of the Philippine College of Physicians (PCP), and himself. 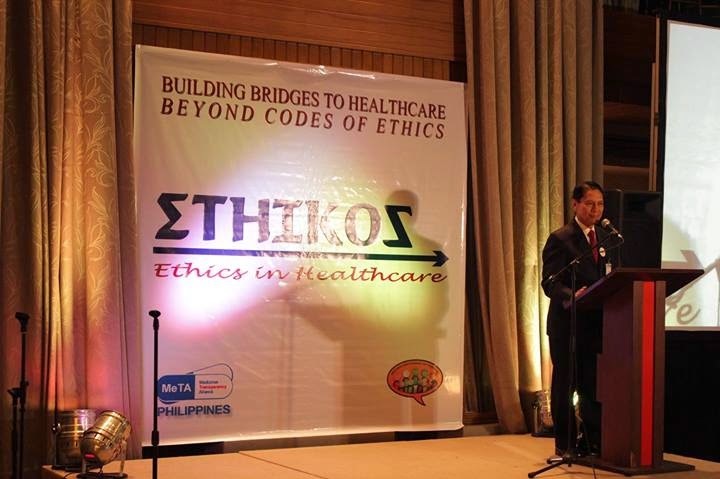 He discussed what ETHIKOS is – a movement to encourage ethics in delivering healthcare to the patients, ethics in dealing with healthcare professionals and other private players in the sector, ethics in government. Dave said that the local pharma industry is supporting the Mexico City Principles (MCP) for voluntary codes of business ethics in the biopharmaceutical sector. 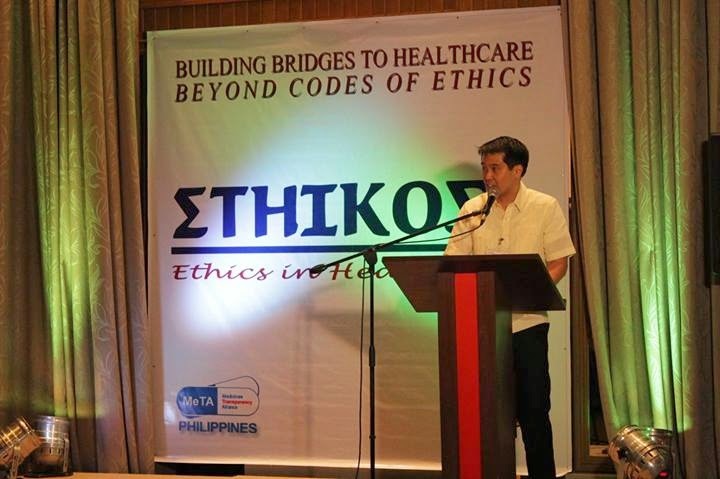 He introduced a similar term, “Manila Principles” where the basis of such code of ethics are the Generics Act of 1998 and the Cheaper Medicines Law of 2008 (RA 9502), and the object of such ethics is the welfare of the patients. Thus, the Manila Principles should consider TRIPS flexibilities as contained in RA 9502, avoid whenever possible prolonged data exclusivity, disallow frivolous patents, allow early working of soon-expiring patents of innovator drugs. He lamented that many local pharma companies are small and lesser known compared to big multinational pharma. 3. 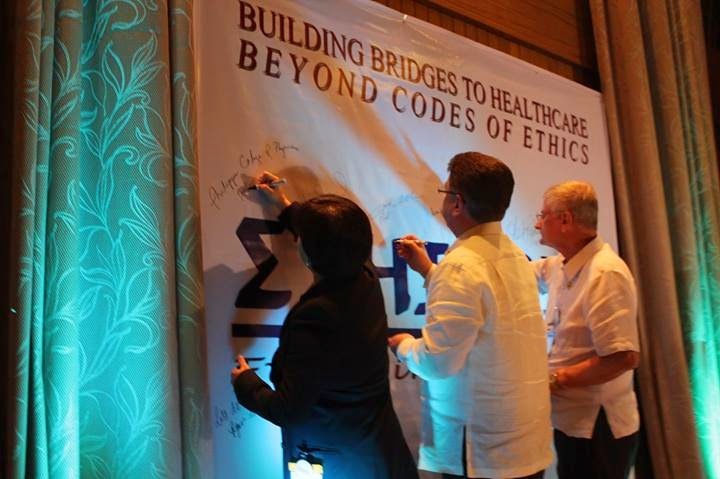 Teodoro “Ted” Padilla, Pharmaceutical and Healthcare Association of the Philippines (PHAP) Executive Director. He emphasized that no amount of health reform will be truly universal if people and players ignore the consequences of unethical behaviour. He also expressed support for the FDA to implement the MCP. Then he mentioned the important role of the innovator companies for endlessly producing new medicines which help save lives and improve the quality of life of Filipinos. 4. Kenneth “Ken” Hartigan Go, Food and Drug Administration (FDA) Director-General. (d) to reverse a regulatory decision. My comments to some of these points in my next article about ETHIKOS..
A tax cut seems to be an "in" thing these days as there are bills at the House of Representatives (by Cong. Miro Quimbo) and the Senate (by Sen. Sonny Angara) cutting the marginal income tax rate from 32 percent to 22 or 25 percent. 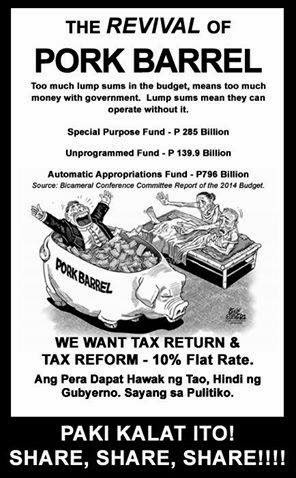 Of course the BIR has its own version to complicate existing taxes. One of the known advocates of a low, flat tax, is former Manila Councilor Greco Belgica. In the 2013 elections, he ran for the Senate. He was not serious in winning of course. He only used the elections to propagandize the flat tax philosophy, which was a good strategy. In his facebook wall, Greco posted these two entries in his wall a few days ago. These were shared by some of his friends. My comments after these two entries. My proposals during the 2013 election and the proposals today. 1. 10% Flat rate tax. vs lower tax proposals in both houses. 3. Conversion of the Pdaf to Tuition Vouchers. - Tuition vouchers are now available for k-12 students. These ideas comes are principles of a limited and small government. The same worldview and ideas espoused by our young heroes through the constitution they have written and fundamentally carried over by the constitution we still have today. And principles applied by all free nations and all men who fought for liberty. Crony-capitalism are products of a centralized system of government – a system communism and socialism espouses and most governments today share, including the Philippine government. During the time of President Marcos, Cronies enjoyed all power, resources and opportunities from 1 man holding all powers of governments. Today, Cronies enjoy the same privileges from 1 and the same government, however held by 2M bureaucrats and elected officials. Re-distributing wealth, power and opportunities to the few at the expense of the rest through government laws and regulations. GDP growth rates are useless economic indicators. The economy measured as a whole is a useless indicator of economic strength. It measures collectively as a whole and has nothing to do with individuals and family needs. People are at the center of all economic activities not government. In a free and christian society, government has nothing to do with business. People create governments. Governments does not make a people. A nation exist primarily as individuals and families seek to come together and bind themselves through a constitution to preserve themselves and co-exist. Primarily as individuals and as a family, secondarily as a country. The centralized view of society espoused by communism comes from the same world view GDP measures society. There is no freedom in communism while there is no poverty with liberty. GDP as standard for economic strength is false. That explains why while government continues to say GDP is growing, poverty continues to grow as well. Correct economic standards must view the economy from the standpoint of the home and individuals. The true standard are the extent resource – LAND & CAPITAL – are made available to FAMILIES and INDIVIDUALS and NOT Governments, Multinational companies and mega corporations. The extent of a centralized power and system of government is proportionate to the extent of CRONYISM of a country. Economics can not be measured or treated as a whole. It is measured through the homes. The extent of the availability of resources (LAND & CAPITAL) to individuals and families and the extent of liberty one enjoys to trade and pursue his dreams and happiness without threats of confiscation and the strangling arms of government regulations against life and property and private properties. Many good points like distrust of big government, socialism and communism, emphasis on individual liberty. And the need for a flat tax, 10 percent single rate. This is a brilliant proposal, not original of course as there are several countries in the world now which have 10 percent flat income tax rate, both for individuals and corporations, like Georgia, Russia. I voted for Greco in the 2013 election mainly because I could not fill up the 12 Senatorial slots and I believe in the low, flat tax proposal. I think I filled only about six names in the ballot, Belgica included. But he has a few wrong points above like "GDP growth rates are useless economic indicators" without identifying alternative measurements of growth, micro or macro. One alternative to GDP growth is electricity consumption growth. When people are well off, they tend to have more gadgets and appliances, more air-con rooms, more lights, resulting in high electricity consumption. If they are poor, they cut spending on electricity. But Greco himself did not identify any alternative measurement. A change to employment rate as measurement of economic strength is itself tricky and not reliable, for these reasons. One, definition of underemployment. Someone working 10-12 hours a day and still "wanting additional work" is considered as underemployed. Or someone already earning P100k a month but "wanting additional work" because he wants to earn P130k a month is also considered as underemployed. Two, definition of unemployment. Someone who has been offered P80k a month but refuses it because he is waiting for a possible job call that will pay him P100k a month is considered unemployed if an NSO surveyor happened to ask him that day. Three, reference period. It is possible to have a good overall business environment for 3 months but the labor force survey, conducted for only 1 or 2 days per quarter, was done on a bad day, and so employment data is bad. Or the business environment for that quarter is generally bad, but the survey was done on a rather good day, so employment data is good. Thus, using employment figures, themselves are aggregates, as replacement for GDP growth figures is even more questionable. For people with anti-GDP angsts like Greco, here are a few questions: If you wish to know how much was the growth (or lack of growth) of agri, in particular rice, corn, sugarcane, poultry, fishery, etc., how do you go about it? If you wish to know how much growth (or lack of it) occurred in the services sector, especially in tourism, buses, retail shops, etc., how do you go about it? I think their answer would be simple, the sound of silence. Currently, these sectors and sub-sectors are being measured. The measurement is not exact of course, it can never be perfect, but the estimates are there, including how much contribution from the informal sector. I think there should be no state or local government-owned universities; all universities including UP should be private. Then government will give education vouchers to ALL university students, flat rate. say, P25,000 per university student per semester, maximum of 10 sems, and students must maintain a minimum of weighted grade average. If the student enrols in a P50,000 school fees per semester, he or his parents/guardians will simply pay the balance. Or he can look for other scholarships to fill the gap. Poorer students can enrol in cheaper universities and pay nothing. This way, every university student is an "iskolar ng bayan", funded from taxes. And universities will work hard to improve their education to attract more students who all have money. If government should subsidize university students, it should subsidize ALL, not just those in state universities. Currently the policy is very discriminating. If you enroll in UP, PUP, etc., "iskolar ng bayan" ka but if you enrol in UE, UST, etc., you pay on your own even if your parents pay taxes, part of it goes to state universities. Mini-cronyism in education. A friend commented that in Nordic countries like Norway, education in all levels is free. Well, this is a function of how much social surplus a society has. High productivity, low population countries can afford that. But there is nothing wrong with parents paying for the education of their kids. After all, there should be more personal and parental responsibility in any society, and less government responsibility. Alangan naman painom-inom, pa-party-party lang parents, arguing that "education is government responsibility, not parental responsibility." Let parents and guardians have more responsibility, more purchasing power, and have more choices. About results of the annual bar exams and the Philippine Military Academy (PMA) graduation, this is one fixation by the mainstream media and the public. Each year, zero exception, the bar top notchers and PMA top 10 graduates, are in the front pages of national newspapers and in TV news. These guys are achievers, true. But there are other guys who are also great achievers, like people who come back to the country with a PhD in number theory like Fidel Nemenzo. Or a PhD in astrophysics like Reina Reyes and so on. And they are nowhere mentioned in mainstream media. Which somehow speaks how politically biased, or even shallow, the mainstream local media is. If you are the future Senator or Congressman/woman or President because of your cool achievement in the exams for lawyers, and if you are a future general with command and control of a huge army of men and women with guns, bombs, tanks and jet fighters, the public should glorify you now. Two weekends ago, I gave a talk at the University of San Carlos (USC) in Cebu City, some 100 Pharmacy Economics students of a friend, Prof. Frank Largo. Frank is a fellow UP School of Economics (UPSE) alumni, also a fellow International Academy for Leadership (IAF) alumni at Gummersbach, Germany. Four years ago, I also gave a talk at his Economics graduate class also at USC. I was one of four speakers then. 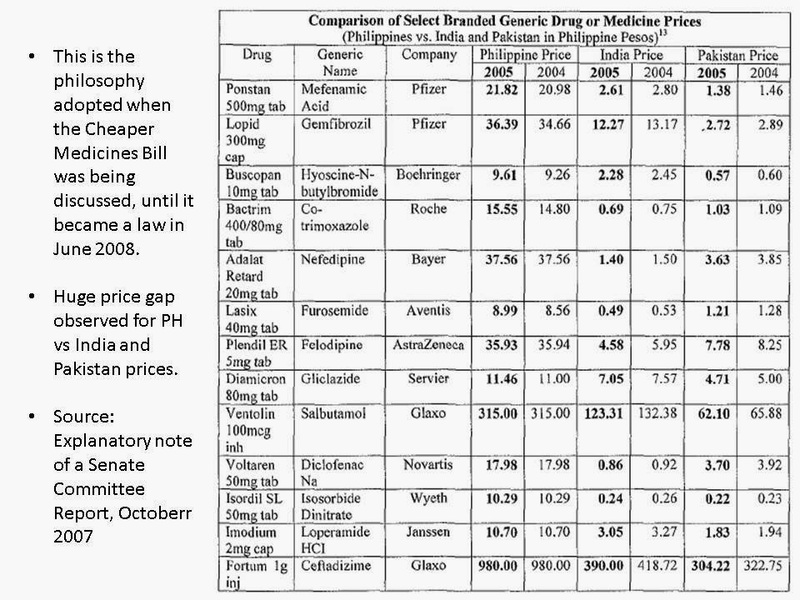 See Drug Price Control 38: Presentation at USC, Cebu, March 2010. The other speaker that day was Prof. Eric Salenga, Chairman of the Pharmacy Department, UP Manila, also President of the Young Pharmacists Association of the Philippines (YPAP). He's a very articulate speaker. III. Senior citizens discount of RA 9994, IV. Conclusions. Many of those who advocate government price control and/or mandatory discounts of certain commodities in society make this faulty assumption. That same product with same dosage or quality made by the same manufacturer in the same country should have only one price nationwide. Thus, medicine price by the same manufacturer should be the same regardless of outlets. Any difference in pricing is explained by corporate greed; the wider the price difference, the bigger the greed, so government should control or limit that greed in the name of public health and welfare. This can be an emotionally powerful argument. 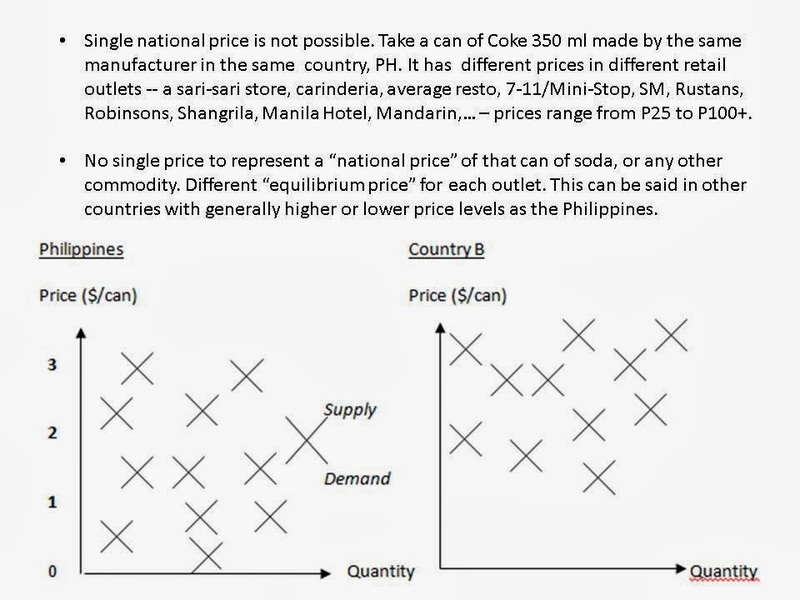 When this logic is applied internationally, it would imply that same product with same dosage or quality by same manufacturer made in different but similarly developing countries should have little price differentials. But why this did not happen? This line of thinking is illogical because there can never be a single national price. I asked some individuals who were involved in the lobbying and crafting of the Cheaper Medicines bill into a law, RA 9502, the raw data for such price comparison in the above table, they could not present one. Those numbers in the Senate Committee Report therefore, were suspicious, but they have become strong basis for enactment into a law of the bill. * Amending the Intellectual Property Code (IPC) to allow TRIPS flexibilities in the intellectual property rights (IPR) like patents of innovator drugs and allow compulsory licensing (CL), special CL, “early working” and parallel importation. * Drugs and medicines price regulation through the issuance of maximum retail price (MRP, not MDRP or GMAP). * Non-discriminatory clause, amending the pharmacy law and generics law and strengthening BFAD, now FDA. * Only one goal: cheaper and safe medicines be more accessible to the poor. But even before RA 9502, average medicine prices were already declining. Not because of political coercion and harassment, but because of competition among drug manufacturers themselves. 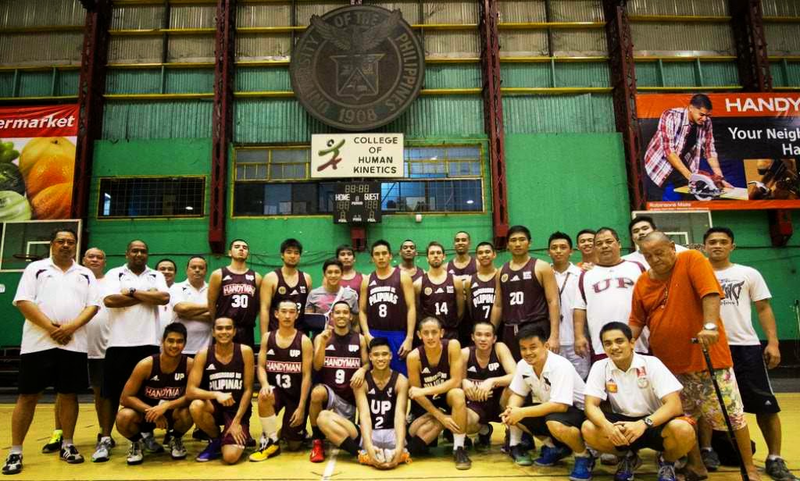 As a University of the Philippines (UP) alumni myself, I find this story disturbing, but also inspiring. This should spur other alumni and sympathetic individuals to act on their own -- the spirit of civil society -- to help the UP Fighting Maroons. Written and posted by a friend in his facebook wall last Saturday, reposted by interaksyon yesterday and so far was shared 1,500+, reposting here too. 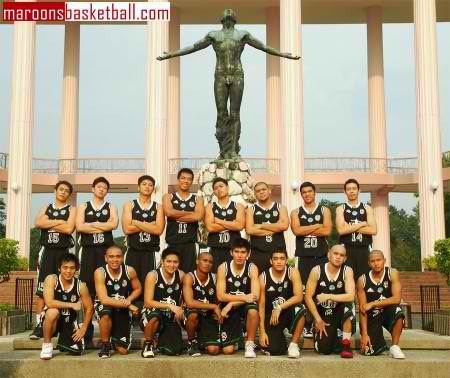 …Our Maroons took the championship in '86 in the same year our countrymen won back their freedom. I don't know if it was something that reflected the “mood” of the times. After the jubilation, the “ultimate victory,” we seemingly grew complacent. We were the best but had stopped getting better. '86 was UP's last championship. Every year since was a disappointment, in varying degrees. We had built up leads in the first half only to squander them in the dying minutes. We surged on early but could not follow through 'til the end. UP has been crown-less in 27 years and winless in the last three. Recently, I met somebody from the Maroon's coaching staff and I got to learn why: Our team has been playing hungry, literally. They have been going to practice on empty stomachs, playing competitive games without the nourishment required of a student-athlete. They've been walking on foot from one class to the next, one destination to another to save a coin or two for their education. They have not been receiving their allowances, the measly sum of anywhere from P5,000 to P10,000 -- a pittance considering what they have to go through to play for the country's Premiere University while measuring up to its stringent academic standards. The game has grown sickeningly “commercialized,” I know. UP stands by its ideals, I know too. The University rewards integrity and excellence, but if its meager budget does not allow it to, should not the alumni step in? Other Universities invest shamelessly in their athletes. Should we not share a little if only to afford our fellow Isko a modicum of self-respect? But like I said, basketball has grown shamelessly commercialized these days. The other school went directly to our player's hometown to talk to his parents. If the kid won't agree, perhaps, the parents will be a tad less uncompromising, they must have thought. Hearing the story evoked a feeling similar to what I had felt when I first set foot in Guian, Samar after the great storm. Right there and then, only one question loomed in my head: What can I do to help? There, amidst the ruins, they play the game for the sheer joy of it, like any sport should be, competitive or otherwise. Here, despite poverty and the allure of the “easy buck,” one of ours needs help so he can continue pursuing a childhood dream. If basketball can help a nation cope with devastation, surely its people can give back to those who live only to honor the game. This kid, or rather, this man of 17 years, has reminded me of what I have long learned -- though sometimes forget -- from UP. It is not just about winning as it is about playing to deserve the victory. Sa kanyang mumunting paraan, sa tatag ng kanyang paninindigan, ipinaalala niya sa aking hubad ang tagumpay kung hindi nagmula sa pagmamahal -- pagmamamahal sa komunidad, at pagmamahal sa bayan. In his small way, on the strength of his conviction, he reminded me that victory is empty if it does not come from love -- of community and people. I did not promise him what other schools offered. I had neither the resources nor the respect for that grease. What I have are friends, fellow alumni, whom I know have the generosity to justify the varsity's faith in its school. I committed to begin passing the hat -- for decent meals, for Ikot fare, for lights in their sleeping quarters. I promised I would be part of a community -- the UP community -- that has never been known to abandon its own. Right now, like his father, all I want is 1 win. Where we are, where we have been, and how we have defiantly bounced back from adversity, I know we have nowhere to go but UP. But mostly because our Maroons want nowhere else to be, deserve nowhere else to be, but UP. Market failure can be created by everyone and anyone in this planet, anytime and anywhere. For instance, person A will demand a USB/flash disk with 100 GB memory sold for only P300. Person B may demand for the same product for only P400 (their “willingness to pay”) and so on. There is a demand for that product. Where is the supply? Zero at those prices. There is no market clearing price as its current price could be several thousand pesos now. Market failure. Person C has invented through biotechnology a tilapia variety that can grow to commercial size within a few weeks and selling the fingerlings at P50 each. No one buys as the price is deemed too high. There is supply for a particular product but demand is zero. Another market failure. In both cases of market failures, should government intervene as often advocated by many sectors, that government should come in anytime anywhere where there are clear market failures? Nope. There are millions of unmet demand every day in this planet. And conversely, there are also millions of unmet supply every day in the planet. 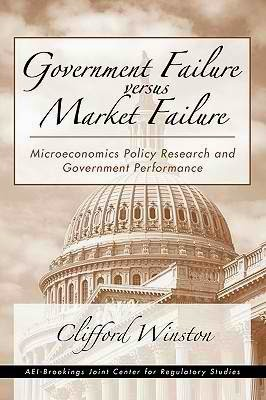 It is simply impossible both for technical and fiscal/financial considerations for government to come in for each of those market failures. Market solution to market failures can occur within the day or within a year or within a decade or century. Where there used to be market failure several years ago, there is market solution by now, or next month. The Philippines has P 1,025 Billion for all the Departments. We want job generation for inclusive growth and the Departments in charge are the poorest: NEDA, 5 Billion and DTI, 2.8 Billion… DA has a very big budget - 63.7 Billion but with all the corruption in this agency, nothing much has happened to our agricultural sector. I commented that we do not want government as currently the biggest employer to become “biggest-est” employer. Nandy agreed and added that even in mainstream economics, market failures such as coordination failure and externalities need government intervention, and would require sufficient resources. He is right, and in mainstream economics, it also says that market failure is only a necessary but not sufficient condition for government intervention. Because frequent intervention often introduces government failures, solutions that can be worse than the problems they intend to solve. Whereas market failure invites market solution. The single biggest job that government can do to encourage more private sector and civil society employment, plus self-employment, is to have strong rule of law system in the country. Contracts should be respected and enforced and people will have long term faith in the economy. This is not to say that "we abandon all government interventions." No, no, only anarchists would say that. Having rule of law, like impartial and credible courts, police and justice system, stable policies, is one important form of government intervention that must be pursued. It is important that people should recognize that frequent government intervention to correct any perceived market failure is counter productive. Very often, it would help if government will intervene less, regulate less, in addressing certain market failures, real or imaginary. Regardless of the people or personalities in government that we put in. 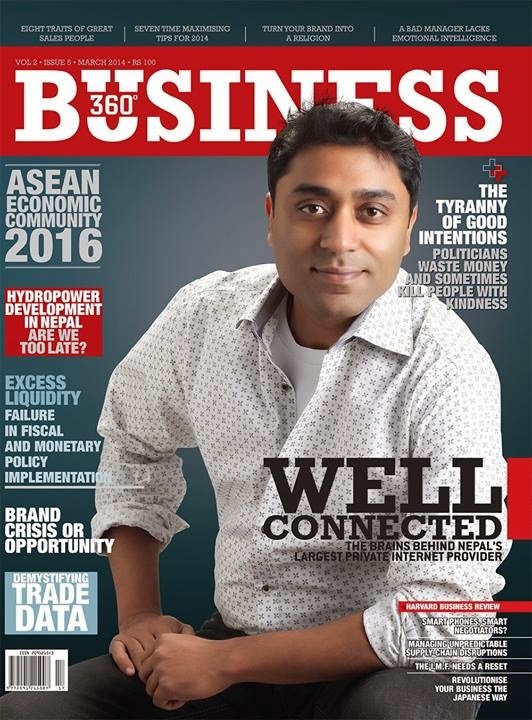 * This is my article for B360, a monthly business magazine published in Kathmandu, March 2014 issue. The Association of SouthEast Asian Nations (ASEAN) is composed of 10 countries in East Asia -- Thailand, Myanmar, Laos, Cambodia, Viet Nam, Philippines, Brunei Darussalam, Indonesia, Malaysia and Singapore. It has a combined population of around 670 million people -- about twice the US population. 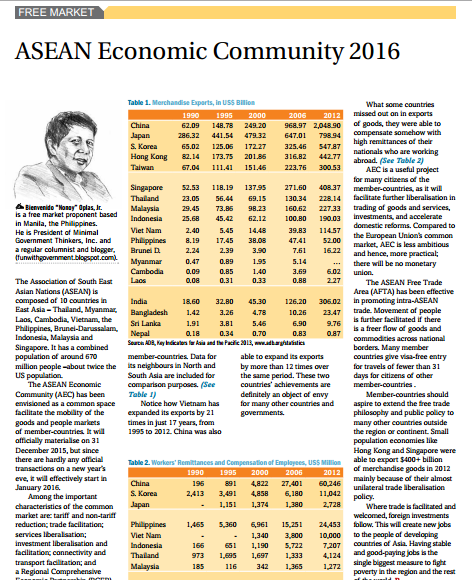 The ASEAN Economic Community (AEC) has been envisioned to be a common space to facilitate mobility of goods and people markets of the member-countries. It will officially materialize on December 31, 2015 but since there are hardly any official transactions on a new year’s eve, it will effectively start in January 2016. Among the important characteristics of the common market are: tariff and non-tariff reduction; trade facilitation; services liberalization; investment liberalization and facilitation; connectivity and transport facilitation; and a Regional Comprehensive Economic Partnership (RCEP). 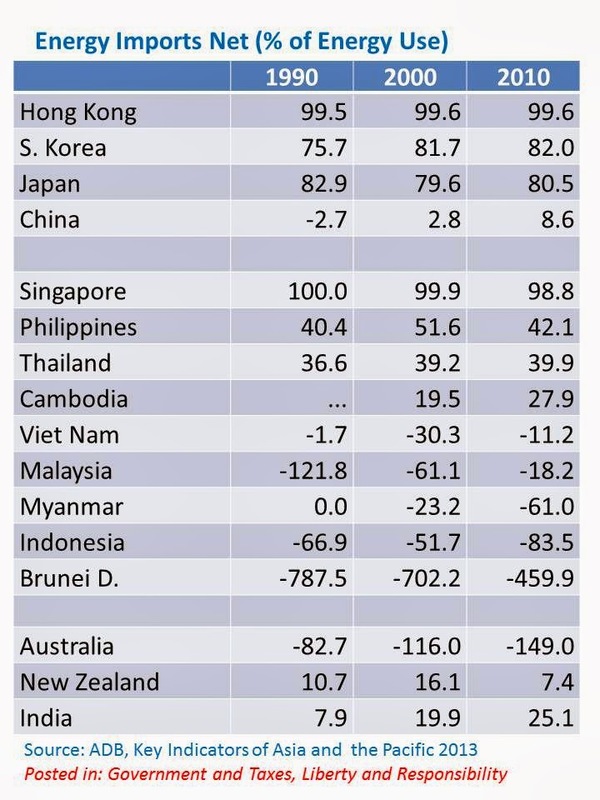 Since trade facilitation and liberalization is the cornerstone of the common market, here is some data on the exports performance of ASEAN member countries. Data for its neighbors in North and South Asia are included for comparison purposes. 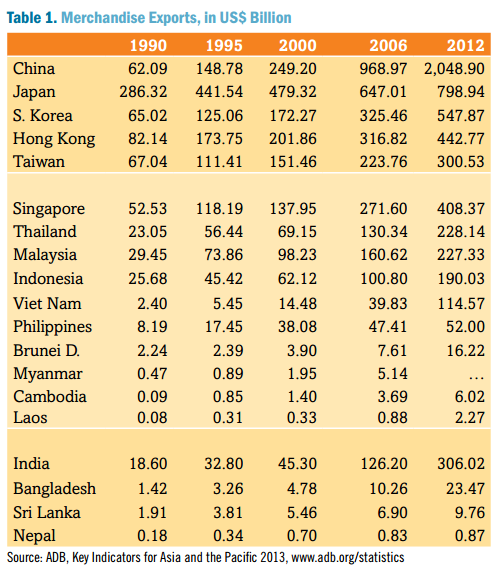 Notice how Vietnam has expanded its exports 21x in just 17 years, from 1995 to 2012. China was also able to expand its exports by more than 13x over the same period. These two countries’ achievements are definitely an object of envy for many other countries and governments. What some countries miss out in exports of goods, they were able to compensate somehow with high remittances of their nationals who are working abroad. AEC is a useful project for many citizens of the member-countries as it will facilitate further liberalization in trading of goods and services, investments, and accelerate domestic reforms. Compared to the European Union’s common market, AEC is less ambitious and hence, more practical; there will be no monetary union. The ASEAN Free Trade Area (AFTA) has been effective in promoting intra-ASEAN trade. Movement of people is further facilitated if there is freer flow of goods and commodities across national borders. Many member countries give visa-free entry for travels below 31 days of citizens of other member countries . Member countries should aspire to extend the free trade philosophy and public policy to many other countries outside the region or continent. Small population economies Hong Kong and Singapore were able to export $400+ billion of merchandise goods in 2012 mainly because of their almost unilateral trade liberalization policy. Where trade is facilitated and welcomed, foreign investments follow. And this will create new jobs to the people of developing countries of Asia. Having stable and good-paying jobs for the people is the single biggest important measure to fight poverty in the region and the rest of the world. 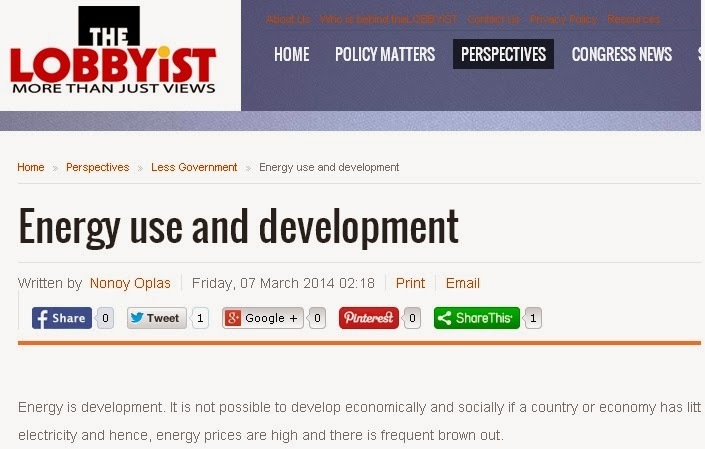 * This is my article in thelobbyist.biz last March 07, 2014. Energy is development. It is not possible to develop economically and socially if a country or economy has little electricity and hence, energy prices are high and there is frequent brown out. In many economic literatures, growth in energy use is often used as proxy or “checking mechanism” for GDP growth as there is a generally one on one correspondence in energy use and real GDP growth. 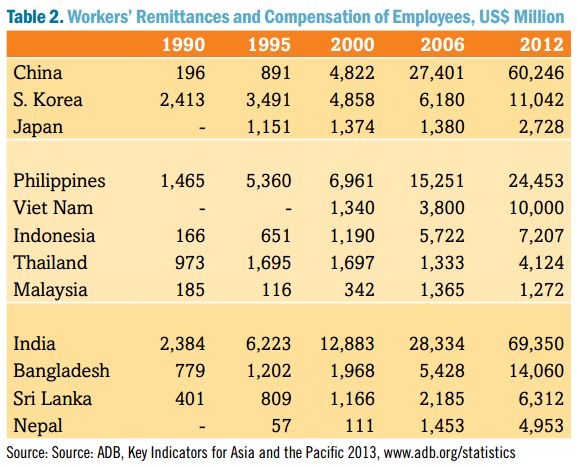 A data from the Asian Development Bank (ADB) is very interesting, below. Countries are grouped into three: Northeast Asia, Southeast Asia, and others. Some interesting notes here, that as of 2010: (a) China has 5x energy use than Japan; (b) Japan's energy use has almost flatlined over the past two decades; (c) Singapore has twice the energy use of HK; (d) Vietnam has overtaken the Philippines with 50 percent more energy use; (e) from 1990 to 2010, these countries have generally tripled (3x) their energy use: China, S. Korea, Thailand, Malaysia and Singapore; and (f) Vietnam has expanded almost 4x. One possible explanation here is Kyotoism, the Kyoto Protocol (KP) of countries reducing if not backsliding carbon emission (indirectly, energy use) that is not too far from their 1990 levels. Japan, Hong Kong and Australia must have tried hard to obey the global ecological central planning while real socialists and central planners China and Vietnam have totally disobeyed the ecological targets. This is one reason why KP was abandoned. When it expired in December 2012, there was no succeeding binding agreement among countries and governments. Many developed countries do not want to de-industrialize, they do not want to have electricity black outs soon. Growth in electricity consumption and energy use in Japan, HK, Australia and several other countries was due to more efficient energy use. For instance, by using only 50 kwh bulb to produce the same street light as a 200 kwh bulb, they could expand street lights 3x or 4x even without adding another power plant. Still, it is good to have more energy capacity while improving energy use efficiency. 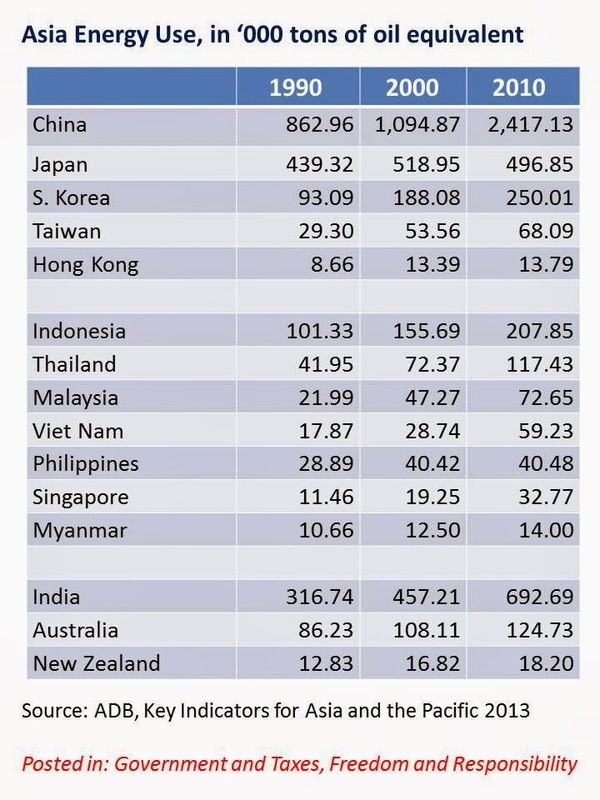 Another interesting data from the same publication by ADB, HK and Singapore just keep modernizing and industrializing by relying almost 100% from imported energy for their power needs. HK gets it mainly from China (mainly nuclear, coal and natural gas) while Singapore gets it mainly from Malaysia, Indonesia and Brunei. There are at least three lessons for the Philippines from the above tables. One, there is an urgent need to expand energy capacity, to have more power generation plants, in the Philippines as more businesses, more houses and schools, other economic activities, are demanding for more stable power supply and prices. Two, “energy independence” sounds cool but HK and Singapore show no interest in such goal. They are almost 100 percent dependent on imported energy yet they seem to be not bothered. Aas long as they have the money, they can buy energy from anywhere. Three, energy prices here must go down through more competition among more private energy producers. Also, government can share the burden by reducing the taxes, fees and royalties for energy projects. Two good essays here by a friend, Dr. Amado "Bong" Mendoza of the UP Political Science Department. There is a need of course to justify which are the real "public goods" that need continued provision by government and hence, would need continued taxation. There is a growing role for corporate and civil society sectors in providing many public goods that used to be monopolistically provided by governments then. Like quick dispatch of relief goods and food items to victims of calamities like heavy flooding and storm surges. Or residential villages that provide many services to the community, from roads/drainage construction and maintenance, street lighting and security, and they collect annual association dues and various fees -- these serve in effect as taxes and regulatory fees . In theory, taxation is essentially coercive because taxes are never paid voluntarily. However, taxes are supposedly collected not only for purpose of collecting them but to finance public goods. Thus, consensual taxation is possible since private taxpayers desire public goods (the reason why they left the state of nature in the first place). In comparing coercive and consensual or negotiated taxation, Michael Moore of the University of Sussex, not the controversial film-maker, argued that the latter constituted a better institutional technology. Coercive taxation (largely in agrarian societies) is relatively ineffective since it tends to generate resistance and because coercive tax collectors were well placed to pocket a large part of the proceeds for themselves. In contrast, consensual taxation offers (within the boundaries of individual states) joint gains for both rulers and taxpayers. 1. “The subjects of every state ought to contribute to the support of the government, as nearly as possible in proportion to their respective abilities: that is, in proportion to the revenue which they respectively enjoy under the protection of the state. In the observation or neglect of this maxim consists what is called the equality or inequality of taxation. 2. “The tax which each individual is bound to pay ought to be certain, and not arbitrary. The time of payment, the manner of payment, the quantity to be paid, ought all to be clear and plain to the contributor, and to every other person. Where it is otherwise, every person subject to the tax is put more or less in the power of the tax-gatherer, who can either aggravate the tax upon any obnoxious contributor, or extort, by the terror of such aggravation, some present or perquisite to himself. The uncertainty of taxation encourages the insolence and favours the corruption of an order of men who are naturally unpopular, even when they are neither insolent nor corrupt. The certainty of what each individual ought to pay is, in taxation, a matter of so great importance, that a very considerable degree of inequality, it appears, I believe, from the experience of all nations, is not near so great an evil, as a very small degree of uncertainty. 3. “Every tax ought to be levied at the time, or in the manner, in which it is most likely to be convenient for the contributor to pay it. A tax upon the rent of land or of houses, payable at the same term at which such rents are usually paid, is levied at a time when it is most likely to be convenient for the contributor to pay; or when he is most likely to have wherewithal to pay. Taxes upon such consumable goods as are articles of luxury are all finally paid by the consumer, and generally in a manner that is very convenient to him. He pays them by little and little, as he has occasion to buy the goods. As he is at liberty, too, either to buy or not to buy, as he pleases, it must be his own fault if he ever suffers any considerable inconvenience from such taxes. 4. “Every tax ought to be so contrived as both to take out and to keep out of the pockets of the people as little as possible over and above what it brings into the public treasury of the state. A tax may either take out or keep out of the pockets of the people a great deal more than it brings into the public treasury, in the four following ways. First, the levying of it may require a great number of officers, whose salaries may eat up the greater part of the produce of the tax, and whose perquisites may impose another additional tax upon the people.” Secondly, it may divert a portion of the labour and capital of the community from a more to a less productive employment. “Thirdly, by the forfeitures and other penalties which those unfortunate individuals incur who attempt unsuccessfully to evade the tax, it may frequently ruin them, and thereby put an end to the benefit which the community might have derived from the employment of their capitals. An injudicious tax offers a great temptation to smuggling. Fourthly, by subjecting the people to the frequent visits and the odious examination of the tax-gatherers, it may expose them to much unnecessary trouble, vexation, and oppression:” to which may be added, that the restrictive regulations to which trades and manufactures are often subjected to prevent evasion of a tax, are not only in themselves troublesome and expensive, but often oppose insuperable obstacles to making improvements in the processes. To Adam Smith’s mind, bad governance is excessive taxation of capital and property. Not taxation per se, as he recognized the need for public goods and the role of the state in the provision of such goods. Bad governance discourages investment and owners of transportable assets can readily change domiciles to jurisdictions with acceptable tax burdens. Smith argued that a tax burden is acceptable to businessmen if the state is able to provide an equally acceptable bundle of public goods. The controversy generated by BIR Commissioner Kim Henares' shaming indictment of an entire profession reminds me of these words I wrote earlier. The FNF Regional Director for East and Southeast Asia, Dr. Rainer Adam, will soon leave our continent as he is assigned by FNF HQ to head the regional office in Eastern Europe. To know more about Rainer, here is a brief note from a good friend and long-term EFN PARTNER, Barun Mitra of the Liberty Institute in Delhi, India. Barun posted this in our yahoogroups today. the continent, and introduced the ideas of liberty to many new comers. 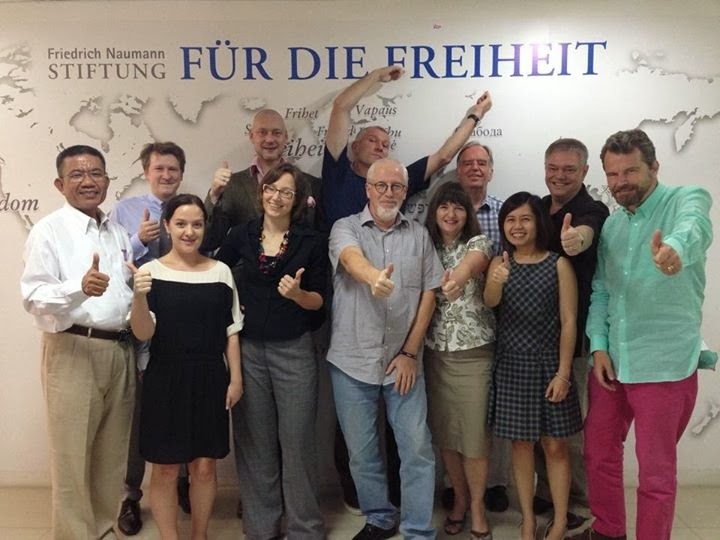 It is difficult to think of the liberal network in Asia, without Rainer. FNF has now posted Rainer to Europe. But the enduring friendship and the ideas he has planted in Asia will last a very long time. I had met first met Rainer in 1994, when he was the FNF representative in China, and hosted the first major international free market conference in Beijing. That was my first encounter with the international group of free market, liberal and democracy scholars, activists, and policy makers. I learned about the world of think tanks, and Liberty Institute was formed about a year after that gathering in Beijing. I still remember Beijing at that time when traffic jams during peak hours used to be caused by thousands of bicycles, and not cars as it is today! After Beijing, Rainer was posted in India, looking after South Asia, then in Indonesia, and lastly in Bangkok, nurturing the seeds of liberalism in east and south east Asia. 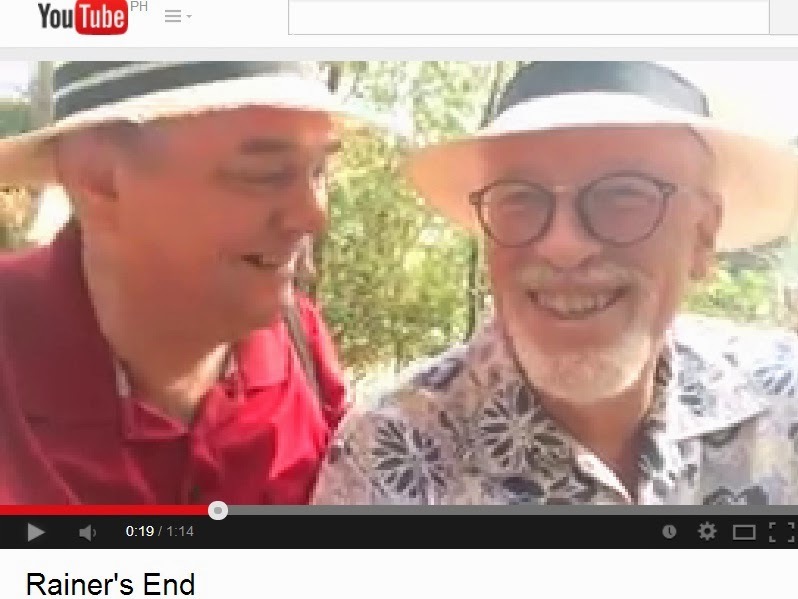 Another reason I will remember Rainer is for the colourful choice of shirts, with typical Asian designs and motifs! Those shirts truly reflected Rainers personality, cheerful, helpful and always encouraging and inspiring. Rainer had adopted Asia with all its diversity as his own. We will miss him in Asia. And I hope he would still have some opportunities to participate at the EFN Asia, and other FNF programmes in Asia. I wish Rainer all the best in his new position in Europe. Rainer enjoys a challenge, and currently old continent has plenty to whet his appetite. Short but good and nostalgic points Barun, thanks. I have met Rainer first time in September 2004, when I was first introduced to the Asian free market and liberal network through the Economic Freedom Network (EFN) Asia conference that year in Hong Kong. He looked like Eric Clapton so being a rocker, I liked his pose. I think I told him that he looked like Eric Clapton and that I was a Clapton fan then, until now actually. was the country director then of Indonesia. 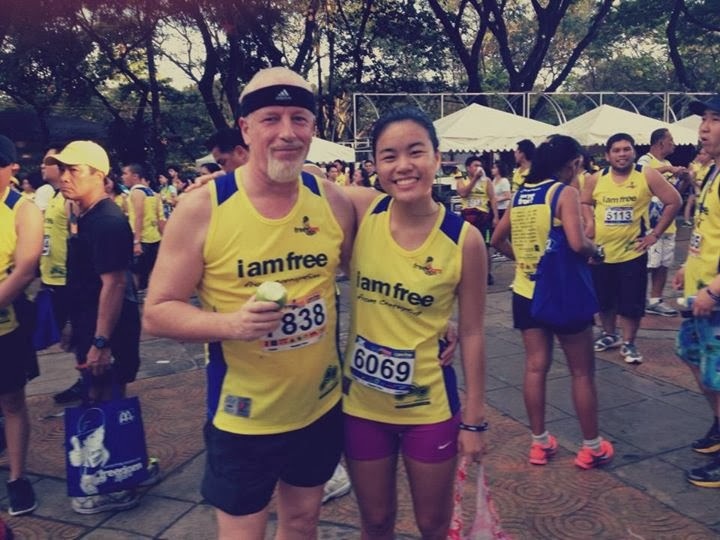 In this photo, with daughter during the FNF PH 3rd Freedom Run in Manila last October 2013. The Regional Director that time was Hubertus von Welck, a tall and mild-looking gentleman, he could be about 6'5" or taller. Then Hubertus was assigned to Africa and Rainer took his place, about six or seven years ago. 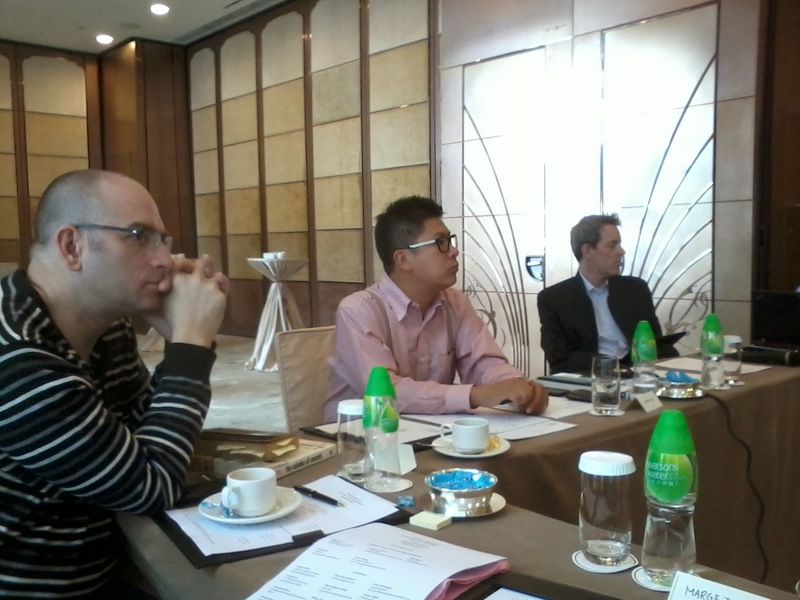 Photo, Rainer with country directors and some chief of staff in the region. Also taken last October in Manila during CALD's 20th anniversary. A friend who considers himself a "social liberal" reposted in his fb wall Akbayan Party's "progressive books", one of which is this book published in July 2013 and written by Cong. Walden Bello of Akbayan. I commented that pallpak na naman (a loser) si Walden Bello and other socialists. Capitalism's last stand? Which is... facebook? twitter? youtube? coca cola? samsung? toyota? shimano bikes? When socialists keep using capitalism's inventions and innovation, they are in effect recognizing capitalism's dynamism. My friend commented that “history has shown the excesses of both planned socialism & laissez-faire capitalism”. 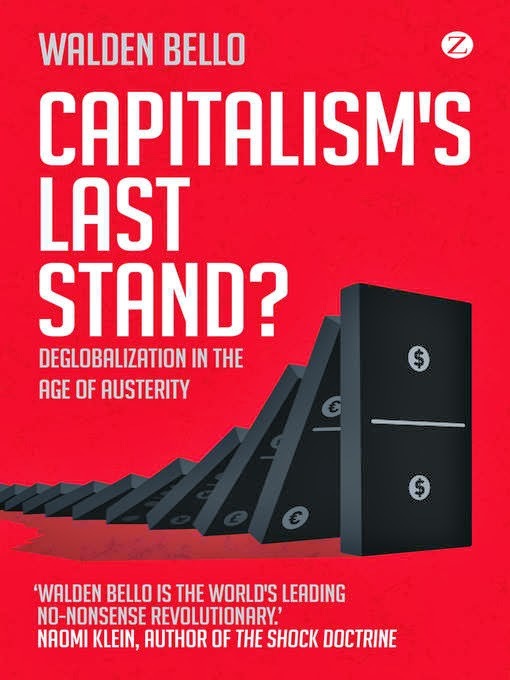 The irony here is that while the world has seen several full socialist, full central planning economies (USSR then, E. Germany and other E.Europe, until the fall of the Berlin Wall in 1989), the world has not seen a full laissez faire capitalist economy. Mention ANY country especially in recent period where such economy is not regulated by SEC, Finance/Internal Revenue, Trade and other Departments or Ministries, Local governments, etc. My bet is that No such economy or country exists. Friendster capitalism was killed not by any socialist revolution or workers' insurrection, but by facebook capitalism. When socialists themselves like Walden Bello, Satur Oampo, other Akbayan/Bayan Muna leaders also hug and embrace many products and services of capitalism, from facebook to youtube, yahoo, google, samsung, etc., the term "Capitalism's Last Stand" is a comedy. See, he's doing a comedy. "Collapse of the global real eonomy", when, where? Visa, mastercard, Citibank, HSBC, Shangrila, Hilton, Peninsula, Toyota, Ford, BMW, Kia, etc. they are all alive and kicking. Capitalism has "died" more than a dozen times in the past. It "died" during the Depression, it again "died" during WW1, "died" again during WW2, during the 70s oil crisis, during the 1987 stock market crash, the 1997-98 Asian finanial crisis, the 2008-09 US housing bubble, the EU debt crisis of 2009-2011, and by Walden 's analysis, it should have died last year too. And it will die again this year. And next year. The Lion Rock Institute (LRI) is Hong Kong's first independent free market think tank. It was formed 10 years ago by locals and some HK-based expats. LRI Chairman is Bill Stacey (left in this photo), an Australian banker who has been living in HK for more than a decade now. Co-founders of LRI Simon Lee (middle) and Andrew Work (right), a Canadian married to a HK lady and was LRI's first Executive Director. 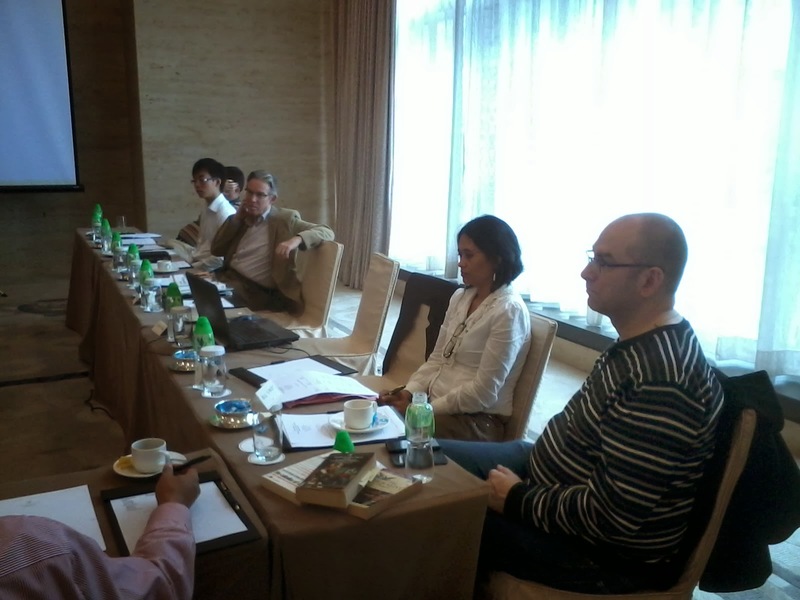 Picture taken during the LRI Reading Salon, October 19, 2013 of which I was one of the foreign participants. Even people who favor free markets will often describe Hong Kong as a city with a business landscape dominated by property developers and their associated conglomerate monopolies. Countless articles seek to “de-bunk” the purported myth that Hong Kong is the freest economy in the world. Such cynicism makes it easier to justify more interventions that chip away at the freedoms we have. Is the property sector really the most important feature of business in Hong Kong? Our city is also the home to many companies, large and small, that are highly competitive internationally. They get on with their businesses with little attention or support from the government – a good thing. Understanding what Hong Kong companies need to be internationally competitive must guide public policy. Compared to many cities, Hong Kong is well endowed with companies founded locally that have grown well beyond our shores and hinterland. It has long been a haven for entrepreneurs grown locally and those who come to Hong Kong from around the world. Take some well-known examples. VTech produces educational toys found everywhere that are renowned for quality at an affordable price. Johnson Electric is a global leader in small electric motors. Techtronic Industries makes household name power tools. These companies compete more than on cost; they manufacture around the world and have invested heavily in their brands. Hong Kong shipping companies and ports operators operate in highly competitive markets with efficiency and profitability that reflects the disciplines honed in competitive Hong Kong markets. Commodities traders (say Noble) rise and fall in Hong Kong. We are the home to a growing suite of leading hotel brands that start with the iconic Mandarin Oriental and Peninsula, but have aspiring additions. Even maligned Hong Kong utilities like CLP and the various Hutchison infrastructure companies have managed competitive international expansion. Hutchison itself has managed to win internationally in retail, ports and telecommunications. The Swire and Jardines groups have rejuvenated conglomerates grown well beyond their local origins. Our city remains one of the best places in the world to establish new financial services businesses. In education, the Kid’s Gallery franchise is a small and innovative business that shows an economy that is broadening. This journal is a reminder of our vibrant publishing industry. Remember Hong Kong is just a city, with 7.1 million people. However, it has fostered companies with much broader horizons.There are characteristics of these businesses that are intimately tied with corporate origins in Hong Kong. They have an international orientation. Many draw management from all over the world, but have a core of efficient Hong Kong born and educated administration that is in a class of its own. There can be no place in the world with better secretarial support. The Hong Kong diaspora means you can hire people here with connections to every corner of the earth and willingness to be mobile. Efficiency is characteristic of Hong Kong. It is easier to get things done here than most so-called international cities. The rule of law abides in commerce and contracts written here garner confidence as much as those in London or New York. Open borders, free trade, the rule of law, fiscal prudence allowing low taxes, a lean government, well defined property rights and a regulatory burden that remains less onerous than most developed markets all make Hong Kong commerce vibrant and create opportunities for entrepreneurs.Few of these strengths rely exclusively on China for their competitive edge. Being globally competitive is usually the best foundation for success in China.Hong Kong is not unique in struggling to develop competitive property markets. Arguably limited and expensive land has encouraged us to economize on its use, finding a competitive edge elsewhere.Hong Kong's traditional city state rivals all have their merits, but none have grown the depth of business or have had the economic freedom that has allowed Hong Kong to thrive -- and must be preserved -- if Hong Kong is to continue its success. A focus on the positives of a free Hong Kong is as important as addressing the negatives that we are all too well aware of.